Steiff Bowtruckle 355134. This amazing hand made piece, in the finest green wool felt, wears the white ear tag, signifying this item as a Steiff limited edition, together with the famous gold plated Button in Ear. The sprig-like Bowtruckle can be immensely difficult to spot in a natural environment as it is not only very small but also can easily blend into any foliage. It appears to be made out of a tree stem with roots, tiny leafy branches and two brown eyes. Newt has at least six of these little beasts - named Pickett, Titus, Finn, Poppy, Marlow and Tom - though he cant help but play favorites with Pickett, whom he keeps safe in his breast pocket. 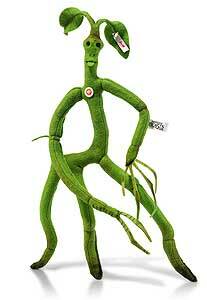 The Bowtruckle, which eats only insects, is a peaceable and intensely shy creature.